Protect your surfaces in style with this set of four tumbled coasters. Crafted from Italian botticino marble tile, these coasters are hand printed in the USA. 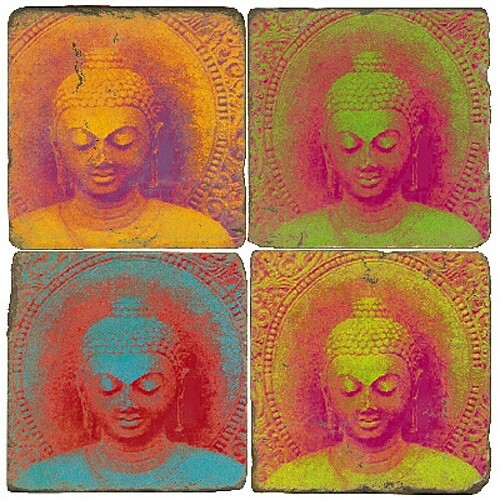 Featuring an Asian Buddha design, each coaster in the set displays Buddha in a different color. Complete with a solid metal display stand, the set is handmade, which provides a unique and rustic look and ensures that no two coasters are exactly alike. Lined with a cork back to protect your furniture, these heavy vintage coasters are great for everyday use and luxurious enough for your next cocktail party or dinner.